So, tell me…what’s better than being sitting on the floor in your pajamas laughing to a movie while eating dinner? Nothing! 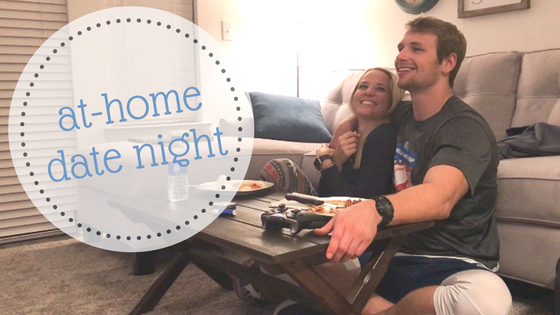 Those are my favorite date nights – lazy ones at home with Steven. Like many people, like many couples we lead busy lives. We each have full time, sometimes demanding jobs. While we don’t always notice it, quality time with each other can be seldom. After a few months of being with someone that “seldom” time can seem like forever but after 5 years that quality time doesn’t seem so long. What I mean is, after 5 years we’ve settled into our own routines. We wake up, go to work, come home and we each like to do separate things to “un-wind” from the day. His routine = playing video games with friends. Mine = Netflix or a book. Then it’s dinner, take Riley outside, and bed. Wake up do it all over. It’s so easy to fall into a routine like that…am I right? While we may get lost in the day-to-day routines of life we must always remember what’s important. One way to remember, reconnect, and make time for each other is date night! Who doesn’t like date night? Also, who wouldn’t like date night at home!? There are nights where dinner is quick, we eat leftovers or even eat separately (depending on schedules and what’s going on of course). Those are all fine and happen but what we decided was to dedicate one night a week where dinner is all about us. We plan the meal, cook the meal, eat the meal and hang out for the night – just the two of us. A way to reconnect if you will. This past week we made Italian breaded chicken pasta. It was pretty awesome! I’ve shared the recipe below with you – it’s a fun meal to make with your partner. Plenty for each to do :). Enjoy!